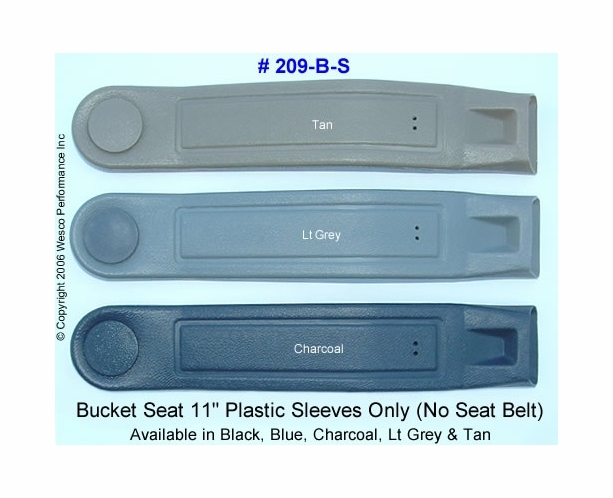 These are our bucket seat style 11" seat belt plastic sleeves, that include the sleeve only (no seat belt). Round cap pops on and off for tightening hex bolt on seat belt end. Price includes 1 sleeve. Available in Black, Blue, Charcoal, Lt Grey and Tan. Click Here to see side view! Restoring a 30 year old conversion van and couldn't find seat belt sleeves like the original....then along comes WESCO! They matched perfectly to what was there...Easy install... THANKS! I have used the Wesco retractable front and lap type back seat belts in F, A, and X body GM cars. Customers love the smooth operation, GM looks, and feel of new car type safety. Belt units are easily adaptable to all early vehicles and late model seats. I got exactly what I asked for in a timely manner and with no problems. Just what I needed. Matched the existing sleeve perfectly. Delivery was fast and the price was economical. These replaced the cracked ones on my Gulfstream motorhome, hold seatbelt close to front seat.